then they suddenly stopped appearing. Not a black sleepy bird in sight! "Thats odd", I thought to myself. all at once....one thousand seven hundred and twenty three crows, turned the sky into a gigantic piece of shimmering coal velvet....and following them attached to a long piece of purple ribbon ...a parcel! Im left all black and blue (and purple) on my bedroom floor. "arrrrrrrr....the SSOF have striked again!!!! !And again they have caught me offguard!" ...its contents are a stroke of genius!!! Many many thank you's to the Fairy that sent it...! but the generosity and kind heart of this Fairy kept me smiling for days after!! You have my eternal gratitude! 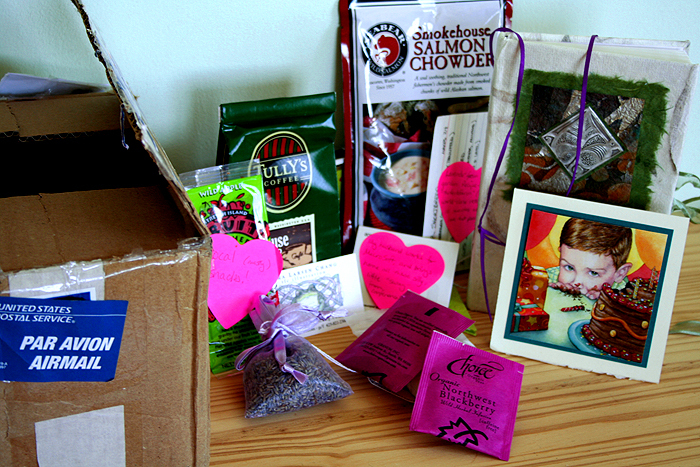 Don't you just love that warm feeling you get after realizing the SOSF Fairy has touched your heart sending her package of treats!Enjoy them all! Mine has also arrived! I'm preparing my presentation!